With the exception of data passing data through Bahrain, Natural + Legal persons are subject to this Law. Article (5) of the Law has put in place conditions for the processing of sensitive personal data. Legal Protection provided for processing data for the purposes of journalism, literature or arts. The Implementing Regulations of the Law will set out specific requirements on technical and organisational standards to be adopted. 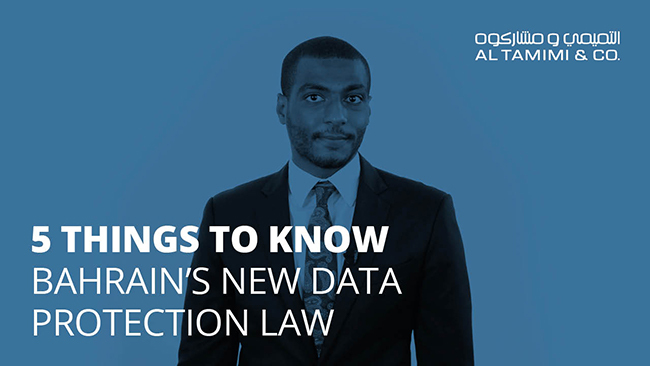 The Law contemplates a role of ‘Data Protection Supervisor’ intended to act as an independent and impartial intermediary between the data controller and the Data Protection Authority. Al Tamimi & Company has a dedicated Intellectual Property team. For further information, please contact Foutoun Hajjar, Partner, Head of Bahrain (f.hajjar@tamimi.com) or Hussain Osman, IP Administrator (h.osman@tamimi.com).